Written by noted entomologist George C. McGavin, this comprehensive handbook covers all 29 orders of insect as well as spiders and terrestrial arthropods. It's packed with hundreds of annotated photographs and illustrations to help you discern the many types of insects and gives you a brief description of each insect family with main characteristics, including life cycles, the environment in which they thrive, and a photographic guide to assist you in categorizing the insect group. It's an indispensable handbook for beginners and enthusiasts alike. Smithsonian Handbooks are the most visually appealing guides on the natural world in the book marketplace. Featuring more than 500 full-color illustrations and photographs, along with detailed annotations, Smithsonian Handbooks make identification easy and accurate. Edition Statement 2nd American ed. 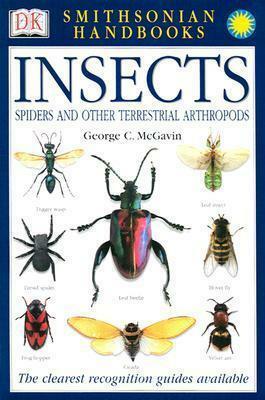 George C. McGavin is a British entomologist. Dr. McGavin is the author of Insects and was a consultant on DK's Animal Life and Animal. Before earning his doctorate in entomology at Imperial College in London, McGavin studied zoology at the University of Edinburgh. He is an honorary research associate at the Oxford University Museum of Natural History.